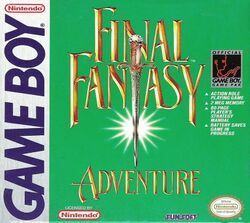 Final Fantasy Adventure, known in Europe as Mystic Quest and originally released in Japan as Seiken Densetsu: Final Fantasy Gaiden, is a Final Fantasy spinoff and the first game in the Seiken Densetsu series. Released in 1991 on the original Game Boy, its gameplay is roughly similar to that of the original Legend of Zelda game, but with the addition of role-playing statistical elements. The story follows the hero and the young heroine as they attempt to thwart the Dark Lord of Glaive and his sorcerer assistant Julius from destroying the Tree of Mana and dooming their world. The game was met with generally positive reviews, noting its strong story but faulting its shaky dialogue, possibly due to the English translation. The game was rereleased, with marked improvements on graphics, music, and story, for the Game Boy Advance in 2003 under the title Sword of Mana. This page was last edited on 27 March 2014, at 19:50.